Home - Andy's Videos - Andy Esquivel Promises to Fix Healthcare! Andy Esquivel Promises to Fix Healthcare! Well, we’ve finally located Andy’s dumbest and most revealign video. I call this the “Healthcare Video” because about 5 minutes into it, Andy claims that he’s using 51% of the profits from the scam to fix healthcare. This is about the time when Congress was debating Obama’s healthcare reform bill, so it goes to show Andy’s lack of creativity. This video is the most telling of all Andy recordings because it was made before he realized he’d be open to the intense scrutiny of this blog or it’s predecessor massage board thread. In it he shows off his full lunatic glory by bragging with wild abandon about the millions of dollars he could be making without any regard for physical reality. Over time Andy’s videos became slightly (but not much) more restrained and he took a little (but not much) more care to make claims that weren’t as easy to invalidate. To add to the fun of this video, I’ve decided to break the lies down by video timestamp. This will allow the viewer to jump to the funniest parts of the production without having to wait through other less interesting claims along the way. :07 Andy claims that he USED to be with Xtagged, implying that he has since moved on. :14 Andy claims he’s suing Ryion for various reasons, which obviously never happened. :18 Andy brags that XOutScams.com is down and says in this video he will reveal why. 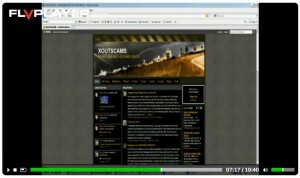 He never does and XOutScams.com is now back online. :35 Andy claims that Xtagged.com has been sold, a claim he later denies. :46 Andy claims there were seven investors in Xtagged and they’re all getting paid back. Obviously this never happened and three of the seven are now pressing criminal charges against Andy for fraud, not to mention civil charges. :58 Andy admits that Ryion was an investor and that he invested $5k. This contradicts Andy’s current fraud defense in which he claims that Ryion wasn’t an investor and that it’s silly to refer to him as one because he helped promote the business, making him a partner int he scam. He also admits for court that he took $5k of Ryion’s money and never gave it back. 1:17 Ryion shows off Logan Laws’ check for $2,500. This is interesting because Logan will be back form his mission shortly and he intends to testify against Andy in court. 2:14 Andy brags that Ryion and Logan bought 1.5% of Xtagged, a company that didn’t legally exist at the time. This further incriminates Andy for the court. 2:32 Andy claims that he lost $1.7 million dollars in potential investments because of Ryion’s blog. 2:57 Andy claims that Logan’s documents are fake…even though they’re signed by Andy and notarized. 3:24 Andy claims that Ryion borrowed his investment from his mother, a charge that is patently false and kind of a dumb thing to assert considering that’s where Allen Brady got his investment. 3:48 Andy claims he’s talked to his lawyers and the truth will come out in court. Of course we now know that at the time Andy didn’t have any lawyers and of course the only court dates Andy has had in the three years since this video was made have been to answer for his various criminal charges including fraud. 3:55 Andy claims that all the documents on Ryion’s website (signed by him and notarized) are fakes. 4:04 Andy repeats his claim that Xtagged.com was sold and laments that it would have sold for a lot more if not for Ryion’s blog. 4:18 Andy asserts that he will be pressin gcharges against Ryion, which of course has never happened. 4:24 Andy claims that Ryion violated an NDA…unfortunately for Andy, Ryion never signed an NDA. 4:50 Andy again claims that he wants to claim criminal charges, which another empty threat. 5:00 Here’s the big one; Andy claims to have sold Xtagged for $2.5 MILLION DOLLARS!!! he says he could have sold the puny little construction paper website for $4.7 milion, he claims, if it weren’t for Ryion’s blogs. He then claims that he turned down an offer for $20 million because the buyers wouldn’t let him donate 50% to charity…which makes no sense whatsoever. 5:18 Andy claims that Steve Klemark is one of the new owners. We later found out that Steve gave Andy $5k and later borrowed most of it back. To assert that Steve had anywhere near $2.5 million dollars at this time is laughable, especially since he was unemployed. 5:20 Andy claims that 51% of the proceeds from Xtagged will go to FIX HEALTHCARE!!! He goes on to assert that everybody in America will have healthcare because of Xtagged. 6:24 Andy claims that Xtagged.com prevents perverts from stalking children online, which is funny because all of Andy’s five children were conceived with under-aged girls who were half his age (one as young as 15). 6:48 again, Andy claims Xtagged proceeds will go for providing free healthcare. 6:59 Andy brags about using Xtagged to buy gift cards for homeless people (an idea he stols from KarmaCurrency.co.au, again illustrating his lack of imagination). 7:20 Andy again threatens to press charges against Ryion…ironic since Ryion is the one who pressed the criminal charges against Andy for which he is now on trial. 7:29 Andy claims that 25% of the proceeds from the Xtagged sale will go to private investors. 8:00 Andy claims that 24% will go to private investors. 8:28 Andy announces the launch of “Bizz/Wiser” as a charity with 50% of the proceeds going to MADD. Of course MADD famously threatened to sue Andy for this claim and made it clear they would have nothing to do with him, his products, or any of his scams. 9:01 Andy claims that “club after club” had been approaching him about Buss/Wiser, demonstrating his obsession with nightclubs and revealing his real motivation for his newest scam. 9:08 Andy goes on and on about anti-hangover pills, an energy drink that forces you to drink water, animated frogs that teach kids not to drink and drive, and other ridiculous hallucinations he was having at the time. 9:26 Andy brags about the deal in which he sold Xtagged. 9:47 again complains about the non-existent NDA with Ryion. 9:50 Andy talks about the aborted $20 million dollar deal to buy Xtagged and tries to explain why he turned it down. He then implores Kyle and Ladd to post against Ryion. Both have since signaled that they will testify against Andy at his securities fraud trial. 10:15 Andy claims that he’s taking $100k of the $2.5 million dollars from the sale of Xtagged and that $2.4 million will go “back into the budget,” which of course contradicts his earlier math in which he claims that 24% is going to Pulitzer “Surprise” winners, 25% to private investors, and 51% to fix healthcare. Yeah, Andy has always been good at making our case stronger against him. We have sent all these videos to Nathen. Andy you better have your lawyer veiw these videos? you make some pretty big claims that your not going to be able to back up. Were going to have so much fun in court.